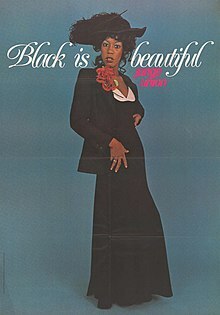 Black is beautiful is a cultural movement that was started in the United States in the 1960s by African Americans. It later spread beyond the United States, most prominently in the writings of the Black Consciousness Movement of Steve Biko in South Africa. Black is beautiful got its roots from the Négritude movement of the 1930s. Negritude argued for the importance of a Pan-African racial identity among people of African descent worldwide. It aims to dispel the racist notion that black people's natural features such as skin color, facial features and hair are inherently ugly. John Rock was long thought to be the first person to coin the phrase "black is beautiful" — during a speech in 1858—but historical records indicate that he never actually used the specific phrase on that day. The movement also encouraged men and women to stop trying to eliminate African-identified traits by straightening their hair and attempting to lighten or bleach their skin. This movement began in an effort to counteract the racist notion in American culture that features typical of Blacks were less attractive or desirable than those of Whites. Research indicates that the idea of blackness being ugly is highly damaging to the psyche of African Americans, manifesting itself as internalized racism. This idea made its way into black communities themselves and led to practices such as paper bag parties: social events which discriminated against dark-skinned African-Americans by only admitting lighter-skinned individuals. While the Black is Beautiful movement started in the 1960s, the fight for equal rights and a positive perception of the African American body started much earlier in American history. This movement took form because the media and society as a whole had a negative perception of the African American body as being only suitable for slave status. The Black is Beautiful movement was based around a fight for an equal perception of the black body to help undo all the negative ideas brought about by a history based in white supremacy. Proving that Black is Beautiful has bled into fashion, where the idea is that dressing with sophistication in mind allows for one to command automatic respect from those around them. This is best exemplified in Black Dandyism, a male fashion movement best described through Monica Miller's book Slaves to Fashion. Since slaves were forbidden from wearing expensive or beautiful fabrics, dressing up the Black body has historically been a radical statement of self-hood and equality. Black Dandyism has morphed over the years, moving from simply dressing sharply in the fashion of the times to what is now the combination of dressing sharply and loud, African-inspired prints and colors that subvert notions of traditional masculinity. In her novel The Bluest Eye (1970), Toni Morrison depicts the effects of the legacy of 19th century racism for poor black people in the United States. The novel tells of how the daughter of a poor black family, Pecola Breedlove, internalizes white standards of beauty to the point where she goes mad. Her fervent wish for blue eyes comes to stand for her wish to escape the poor, unloving, racist environment in which she lives. Blasius, Marc and Shane Phelan, eds. We Are Everywhere: A Historical Sourcebook of Gay and Lesbian Politics. (Routledge, 1997). ISBN 0415908590.